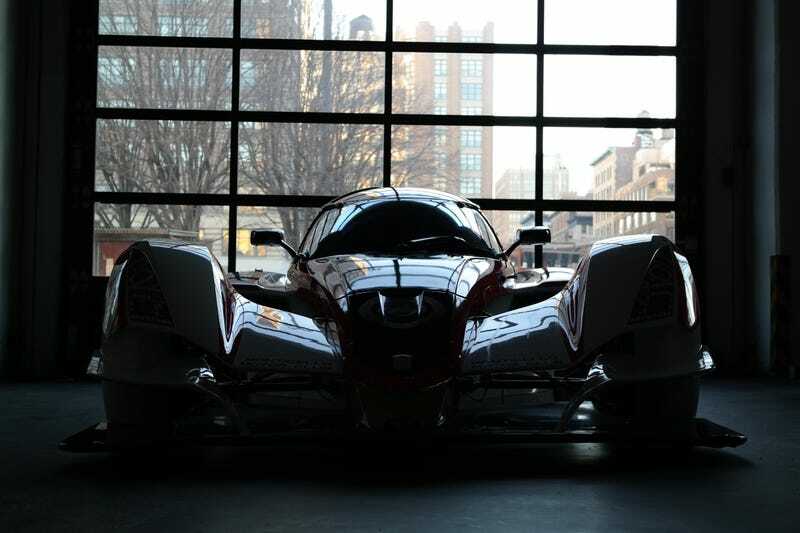 Praga Racing is the latest division of the Praga Manufacturing company, with a somewhat familiar past (to European automakers) of building cars, then motorcycles, then trucks, then buses, then tanks, then airplanes, and now race cars. But wait, what series does batmobile-lookin' thing race in? Well it's kind of a funny tale; Praga teamed up with Radical to create a new series called the Supercar Challenge Superlights, to race in support of the regular Supercar Challenge series. Praga planned to enter 10 of their R1s into this newly minted series, but due to workers striking at the Spanish wheel suppliers' factory, they could only procure enough wheels to enter 3 R1s in the debut race. Slovakian racing at it's best (worst?). A little more about that car: (which I can talk about since reading Roger Garbow's spinney story for Road & Track) It's got a Renault naturally aspirated 4 cylinder making about 210hp, capable of pushing the miniscule LMP1 look-alike all the way to 165 mph. It weighs in at a paltry 1300 lbs, and is capable of a whopping 1900 lbs of downforce. That's like, Men In Black-upside-down-driving in a tunnel capable downforce. Impressive. Monticello Motor Club is launching a new racing school, featuring the first 3 Praga R1s in the country. A weekend with instruction will run you upward of $5,000, once again reinforcing something we already know; racing ain't cheap. Last night they brought chassis no. 3 down to the Classic Car Club Manhattan to feature for a special happy hour event. No one believed it was from Slovakia, not sure why.